Swagelok tube adapters can be used with any Swagelok tube fitting in the Swagelok Tube Fittings and Adapter Fittings catalogue. If you stock union elbows and union tees in various sizes and materials, along with commonly used Swagelok adapters, you'll eliminate the need to stock special fittings that might have long lead times. Swagelok tube adapter fittings are available in a wide variety of configurations, so you can easily adapt from many different threads to tubing or reduce your tubing size with only one Swagelok tube adapter or reducer fitting. At Edmonton Valve & Fitting, we also stock a variety of specialty tube adapter fittings so you don't have to. Call us to discuss the adapter fittings for your unique application. When installing pipe elbows or tees, it is often difficult to align the fitting with the desired run. When using threaded fittings, it can be difficult or impossible to align the connection properly without over- or under-tightening fittings. Luckily, the Swagelok Tube Adapter Fitting provides ease of alignment without the hassle of rerouting the line. 1. In this example, the installation requires connecting tubing to a female end connection. 2. When the pipe connection is tightened, the male elbow points in the wrong direction for the desired run. Loosening the pipe connection could mean leakage at the pipe thread. And over tightening could result in damage to the pipe thread. 3. So, instead, tighten the pipe connection of a Swagelok male adapter into the female end connection. 4. Connect a Swagelok union elbow or tee to the adapter by tightening the Swagelok tube fitting with a wrench, while holding the elbow or tee in the desired direction. Insert the tubing into the other end of the Swagelok elbow or tee and install the fitting. Swagelok tube adapters will reduce the size of your assembly. Fittings, valves, and other fluid system components can be closely coupled by using tube adapters. Using the Swagelok Tube Adapter will also speed up installation because you'll need fewer connections - which also means fewer potential leak points. This will save you time and labor costs. In the image above, the top assembly doesn't use Swagelok tube fittings with tube adapters. The bottom assembly does. The bottom assembly has three fewer connections, which reduces installation time and cost, shrinks the footprint of the assembly, and removes potential leak points. Imagine this being done in a much larger assembly or system wide, and you can see how you can leverage the benefits of Swagelok adapter fittings in a variety of ways. 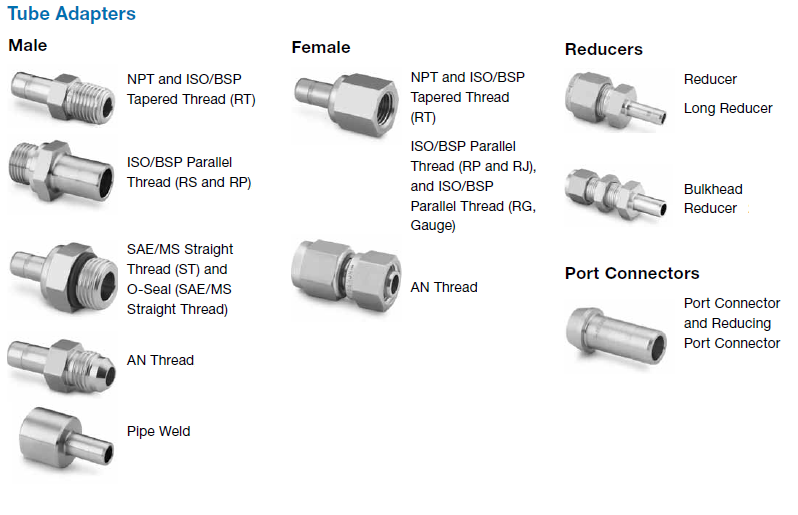 Swagelok adapters, reducers, and port connectors are only to be used in Swagelok tube fittings. Never mix or interchange Swagelok parts with those of other manufacturers. For more information about Swagelok tube adapters, view the video below.